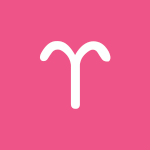 February 2019 Monthly Horoscope Summary for Aries: February features no major retrogrades and Uranus on its final stretch through your sign, dear Aries. The month has a feel-good vibe to it but also holds potential for making serious changes and improvements. Uranus is set to leave your sign for good, and before it goes, it aligns with your planetary ruler (Mars) also in your sign. This is powerful! It’s a fantastic motivational push to sort out your life, gain independence, and do what’s right for you. Take care of an outstanding problem with courage and zeal now. With the New Moon on the 4th, you can be determined to start fresh with a friendship, regarding your social life, or concerning your involvement with others or your community. It’s a powerful time for pushing forward with whatever you were releasing in the last week of January. The Sun continues its transit of your solar eleventh house until the 19th, and this is an excellent time for envisioning what you’d like to accomplish. You are taking into account not only your own situation but the broader context during this cycle. You’re interested in what’s going on around you, and you’re inclined to reach out to others more often. This influence can point to some detachment in your personal life at times, but with a balanced approach, this is an excellent time of year to gain some perspective. February is strong for professional matters. While Venus transiting your solar tenth house from the 3rd forward doesn’t do much for your personal life, it doesn’t seem to harm it, either. There can be times this month, particularly from the 18-23, when you feel stuck, in the position to bite the bullet and toe the line, but it’s likely good for you to do so. Venus here can be excellent for your reputation and career and strong for business relationships. Mercury transits your privacy sector from the 10th forward, and you’re a little more insular or observant during this cycle that lasts a little longer than usual due to March’s retrograde Mercury cycle (it will extend until April 17th!). You tend to adapt to stressors through further contemplation or escaping into your own world. This is a time for giving your life some thought rather than diving right in, which is your usual style! You’re expressing your independence and perhaps breaking free from something that has been holding you back from growing, especially around the 12-13. Watch for slapdash or sudden outbursts and rash decisions that force an issue. Be the one in charge by honoring your heart rather than reacting with your ego. Since the beginning of the year, Mars has been animating your sign, and on February 14th, moves into your resources sector. Mars will be here, heating up your drive to handle, accumulate, and manage your money and personal possessions until the end of March. The Full Moon on the 19th is an eyes-wide-open time for a work or health issue. Your need to serve, take better care of yourself, and attend to your daily affairs is powerful now. From the 19th forward, the Sun heads into your privacy sector as you begin the wind-down period of your solar year. You require some extra time alone to sort out your plans, to recharge your energy and motivation levels, and to avoid overload. Generally speaking, it’s not the best time to get started on a significant project or new initiative, unless it’s about doing preparatory work for said endeavor. Extra sensitivity now can sometimes seem to work against you at this time of year, but it can help you see yourself a little more clearly, since much of the time you can be working on autopilot and possibly ignoring some important emotional or spiritual needs in the process. Now is the time of the year to get in touch, and it’s enlightening! This doesn’t mean you have to while away your time or sit on your hands. 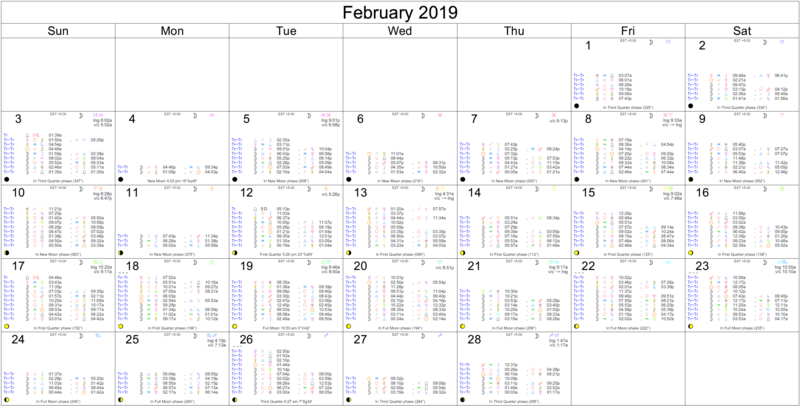 In fact, with the Sun and Mars connecting on the 27th and painting the energies of the last week of February vibrant colors, you’re inclined to get a whole lot done, even if this is mostly happening behind the scenes. Your confidence helps you move obstacles, some of which are self-imposed, out of the way. Your willpower is especially strong now. You can be feeling just enough competitiveness that motivates you and gets you places. It’s a good time for taking care of business with more courage and confidence. You’re courageously putting problems behind you! 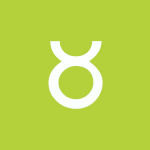 February 2019 Monthly Horoscope Summary for Taurus: There is a strong and pleasant focus on your larger life goals, career, performance, and reputation as you begin February, dear Taurus. The New Moon on the 4th can nudge you toward a new beginning related to any of these areas. It’s a time for reaching for new or redefined goals related to your life path. It’s a powerful time for pushing forward with recent ideas. Venus transits your spirit sector from the 3rd forward, and this is a time for feeling inspired, whether it’s about your relationships, outlook, personal interests, or pleasing pastimes — or any combination of these! Aim high now, but not so high that you don’t know where to begin. Your sign is all for reasonable and practical goals, so you shouldn’t have too many problems with this. Venus here is supportive, gently encouraging you and helping boost your popularity. Mercury transits your social sector from the 10th forward, and this is a further prompt to begin deemphasizing your worldly pursuits and up your attention to happiness goals, friendships, community involvement, and social activities. You could find yourself taking an interest in something entirely new now. The goals are to feel connected and contributing. Uranus will be leaving your privacy sector for good next month when it enters your sign, making February a powerful period for putting something behind you so that you can begin anew. Mars adds muscle to the equation, peaking on the 12-13. Keep in mind that sudden surges of anger or expressions of tension that seem to erupt out of nowhere are actually rooted in issues that you have buried and haven’t yet confronted or resolved. An unforeseen problem might arise, although it’s likely to do with matters that you’ve left unresolved or open. Unusual or sudden desires emerge that likely have to do with your past or behind the scenes activities. Consider consequences, but if you need to break out of a bad habit or a frustrating circumstance, this electric energy might give you just the right push to do so. This can also be a time for a career move or break. The second half of the month plays especially in your favor, Taurus. You have the inner planets on your side, and you’re inclined to feel more than confident and happy to take the lead. While you’re willing to move past obstacles now, there are fewer of them to deal with! Since the beginning of the year, Mars has been transiting the sign behind yours and your solar twelfth house, quietly at work in your life, and on February 14th, moves into your sign. Mars will be here, revving you up, until the end of March. While exciting and energizing, you can sometimes feel tense if you can’t find the right outlets for expressing yourself. Do watch for oversized tempers. It’s a time for taking the initiative. When your energy is properly channeled during this transit, you are highly dynamic and creative. The Full Moon on the 19th offers a potential eyes-wide-open time regarding a romantic or creative matter. You may have been feeling stuck, and this leads to an epiphany about the fun side of your life. It’s a time for embracing your feelings and letting them guide you. You’re in especially good shape to take positive action in the last week of the month. Be as open, willing, positive, and faithful as feels comfortable. Decisions made with, or about, friends and groups can be in focus and they’re made quickly and confidently. There could be a significant new connection formed now, which may come on suddenly but it feels right! Something might inspire you to move forward on a personal goal, dream, or plan. You suddenly see things as doable. There is some inclination to impulsiveness now with Mars in your sign, but if you are listening to gut instincts rather than simply reacting to people around you, then you’re in good form. 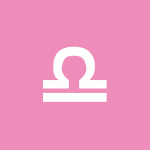 February 2019 Monthly Horoscope Summary for Gemini: The month brings easy energy for studies, small adventures, and interesting happenings, dear Gemini. You’re likely to feel inspired by your experiences and connections. Significant events are possible with friends or group associations. In the second half of the month, you’re connecting more fully with your ambition, but you also recognize a strong need for a little space as Mars moves into your privacy sector. It’s a time for perhaps rethinking some goals or drives, but also for reorienting yourself and replenishing your energy stores. The New Moon on the 4th presents opportunities for a new beginning related to your ideas, studies, personal interests, or sense of adventure and spirited activities. It’s a time for reaching for new, redefined, or refined goals related to life experiences and spiritual or mental fulfillment. It’s a powerful time for pushing forward with a special project, publication, studies, or personal plans. Look around you for opportunities to express yourself, learn new things, and share your ideas. While last month may have been about going deep, now you’re going wide. This is a time for expanding your mind and your audience, if applicable. Gradually as the month advances, however, there are several pulls to serious goals as well as your private and intimate life. Venus transits your intimacy sector from the 3rd forward, and you’re inclined to tap into and explore your affections at their deepest level. Your instincts are good for practical matters, and you’re skilled at getting the most out of situations and improving or deepening relationships now. This is a powerful time for helping others and encouraging them to make the most of their talents or to otherwise thrive and enrich their lives. Later, from the 10th, Mercury transits your solar tenth house, and you’ll find yourself adapting and adjusting in ways that benefit your career, reputation, status, or long-term goals. It’s an intelligent and practical time. Besides calling upon your versatility and putting this trait to full use, it’s a great time for bringing your knowledge, expertise, and intelligence to your professional or public life. You may be watching what you say more than usual now. You’re a shock absorber of sorts during this transit–taking things in stride, mediating, and helping everyone get along. Uranus is on the final stretch of its seven-year journey of your social sector, and this month, Mars and Uranus align, peaking on the 12-13. February is thus a robust period for making changes to a friendship or group association. This area of your solar chart rules your friendships and group associations, as well as your hopes and wishes for the future. Surprising events surrounding a friend can occur now, although this energy can just as easily stimulate a new idea or plan for the future as well. Sudden decisions can happen with this transit. Since the beginning of the year, Mars has been animating your social sector, and on February 14th, moves into the sign behind yours. Mars will be here, working in the background of your life, until the end of March. It’s a time of special attention to your private life or inner world. You may be processing a lot, and not quite ready to make a big move or change. Be patient with this — it’s an important process and a natural progression. Use this time to process and digest, reevaluate and understand your desires. You’re likely to come to meaningful conclusions as you connect with your deeper feelings on a matter. The Full Moon on the 19th opens your eyes to a home or family matter. You may have been feeling stuck or in limbo, and this leads to an epiphany about your domestic world or needs for nurture, comfort, and safety. The last week of February finds you a little more insular but also strongly motivated to take care of business. You want to handle problems right away rather than let them fester or grow. Even so, your ambitions are growing. You have a wonderful sense of what people want. Fortunate connections could be made now, mainly related to life path and career goals. 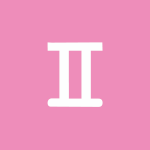 Cancer Monthly Horoscope Summary for February 2019: The month ahead holds fantastic potential for your intimate life, a sense of emotional growth, significant career events, and a growing focus on friends and happiness goals, dear Cancer. The New Moon on February 4th can nudge you toward new beginnings related to your shared finances, intimate relationships, support, power dynamics, or dependencies. It’s a strong time for pushing forward a money-making endeavor, business plan, or lifestyle change. You’ll want to start fresh with money or habits. If you’ve been feeling overwhelmed, this is a time for making empowering changes that help you get your life on track. While this influence encourages you to dig deep, as the month progresses, a more social, connected theme emerges and then builds and strengthens. First, Venus enters your partnership sector on the 3rd. This is a time for connecting with others, checking in with important people in your life, and honoring your close relationships. You’re more willing to compromise and will go to great lengths to make things work. It’s a beautiful time for building and enhancing your connections, and in some cases, attracting a new relationship or bringing a current one to a new level. Next, Mercury transits your spirit sector from the 10th forward, and your vision shifts from deep to broad and wide. This is a positive cycle for sharing your ideas, learning new things, and building your knowledge. From the 14th, Mars moves into your social sector, and then on the 19th, the Sun heads into your spirit sector, too. From this point forward, you’ll have all inner planets as allies, and the mood is light, sociable, energetic, and interactive. Meanwhile, Uranus is spending its final full month in your career and reputation sector before moving on for good. Mars joins Uranus, peaking on February 12-13, and you can experience this as a prompt to make a big career or money move. The desire or need to break free from situations that restrict or limit you is strong and can be positive if it gives you the courage to make long overdue changes. Keep in mind that it can be tricky distinguishing between impulse and intuition, so do your best to tune out distractions and get in touch with your true needs. This can certainly be a time to rock the boat or to dare to do things a little differently. Since the beginning of the year, Mars has been animating your career and reputation sector, and on February 14th, moves into your social sector. Mars continues there, heating up your friendships, until the end of March. This is a good time for connecting with people to enjoy new experiences or for energizing teamwork. The Full Moon on the 19th illuminates a learning, transportation, connecting, or communications matter. You may have been feeling stuck, and this leads to an epiphany about your personal interests or skills. This can be a hectic time when you need to take care of essential errands or tie up loose ends, but also a highly enlightening time when it’s easier to follow your heart. In the last days of the month, you gain wonderful emotional fuel. Making changes seems to come naturally because you are working with an open mind and you’re answering calls to spontaneity. Accepting new ideas and exploring different topics come naturally now, and there could be a decision made regarding friendship, travel, or education. Passions rise, and enthusiasm is strong. 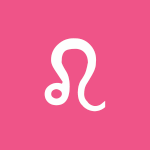 February 2019 Leo Monthly Horoscope Summary: The month is relationship-focused, dear Leo, and holds exciting energy for learning, sharing, and publishing as well. As February advances, you’ll find yourself increasingly focused on business or your more worldly goals. The New Moon on the 4th can boost up a relationship. It’s a period for a new beginning related to your relationships, especially partnering matters, negotiations, sense of balance in your life, and perspective. It’s a time for reaching for new or redefined goals related to a partnership, and something is building, evolving, and strengthening. It’s a wonderful period for connecting with others in valuable, rewarding ways. Even with this social theme, your attention often turns to work, career, business, health, and other practical affairs, and this increases as the month advances. First, Venus heads into your work and health sector early in the month, and your focus on bringing harmony to your daily routines can be fruitful. You have a lot of intense energy in this area of your chart, and that means you often feel pressured to produce, but with Venus here now, you’re enjoying your daily life more and more. You can turn even difficult tasks into fun exercises now. There can be a social theme brought to your pursuit of health or work goals, possibly connecting you with companions or friends through these endeavors. Next, Mercury heads into your intimacy sector on the 10th. This transit encourages making plans and formulating strategies rather than jumping into action. It’s a good time to talk through normally complicated matters or to mediate and negotiate better relations, finances, support, and life strategies. You may be doing more troubleshooting than usual, and you’re very successful at the task! On the 14th, Mars makes it to the peak of your solar chart, firing up your ambitions to perform. The combination of Mars here and Venus and Mercury now in background areas of your solar chart, your business intelligence is through the roof, making the second half of February particularly strong for working productively and getting to the bottom of matters. Meanwhile, Uranus is on its last leg of its transit of your spirit sector, and Mars joins with Uranus on February 12-13. This is a powerful period for last-minute changes to an educational path, belief system, and mental focus or attitude. If you’ve been itching to do something entirely new and adventurous, then these energies can push you into action, especially to make changes so that you live more freely and authentically. A new way of thinking or belief system may even emerge now. From February 14th until the end of March, you’re enthusiastic about taking care of business and anxious to succeed and meet or exceed your goals. While exciting for life path goals, you can sometimes feel that you’re in the hot seat with Mars challenging your sign during this transit. You do prefer a more straightforward approach to life than what’s offered you now, but you can work with this energy and use it to your advantage, laying the groundwork for more outgoing times to come. After the Full Moon on the 19th, you’re likely to see a matter related to your income, financial situation, possessions, valuables, or sense of self-worth more clearly. You may have been feeling stuck or unable to make a move before this date, leading to an epiphany about your needs and wants. You’re pushing through obstacles now. In the last week of the month, you might have the opportunity to collect on a debt or pay off one. It’s a good time to make contacts who help you manage money or who readily support you. You may be able to draw upon resources you never knew you had. It’s an active time for professional matters, but you may need to tone down your manner if you know you’re right and others are not yet seeing it! Think “soft sell” for best results. Indeed, your natural enthusiasm is probably enough to sell a good idea or plan. 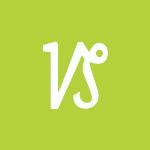 February 2019 Virgo Monthly Horoscope Summary: February becomes lighter as it moves forward, dear Virgo, but you’re in a good position to dig up and handle problems that will help you move onward and forward! There’s an important theme surrounding health and work this month, with an increasing focus on partnerships, learning, fun, creativity, and games. The New Moon on the 4th aligns with your ruler, Mercury, and helps you focus on your priorities. There can be a chance to begin fresh or a new beginning related to your work, health, habits, daily routines, and self-care programs, and new information or insight can be the push forward now. It’s a time for pursuing new or redefined goals related to any of these matters and is powerful for pushing forward with that which you were releasing or realizing in the last week of January. In the meantime, the inner planets are slowly but surely moving into social areas of your chart, and your mood shifts accordingly. First, Venus heads into your creativity sector on the 3rd, exciting your interest in romance or creative pursuits, hobbies, entertainment, and leisure. While you should watch for a tendency to make decisions based on the desire for others’ appreciation or approval, kept in check, it’s a wonderful time for exploring your creative side and allowing it to shine. You can turn your desire for approval to your advantage and use it to motivate you to improve as well as express yourself and share your creations and feelings. Second, Mercury moves into your partnership sector on the 10th. Mercury is usually quick, covering a sector in about three weeks, but this time around, Mercury will stick around for over nine weeks. You see your life in new ways as others offer you their perspective. You learn about yourself through conversations and companionship during this transit. It’s a good time to pair up with someone, and your desire for mental companionship and cooperation can lead to interesting connections and experiences now. Next up, Mars moves into your spirit sector from the 14th, and then the Sun joins Mercury in your partnership sector. All signs point to a more involved, connected, and sociable time. Uranus is spending its last full month in your intimacy sector and aligns with Mars here on February 12-13. This is a powerful period for moving on from an unstable period related to your intimate life, financial situation, or support, perhaps with one more push or thrust! You may have a strong desire to clear up excess debt, both material and psychic, and to get rid of excess baggage in general. This is a time for mustering up the courage to make meaningful changes, but it’s important to distinguish between impulse and intuition. Reacting keeps you tied to others in uncomfortable ways while taking action puts you in charge of your life. Watch for surprises or abrupt moves in an intimate relationship now. On February 14th, Mars moves into your spirit sector, firing up your desire to get a little more from your life until the end of March. You tend to fight for what you believe in, and you’re more courageous about expressing your ideas or opinions. This can be the start of an exciting new passion or interest. After the 19th is an eyes-wide-open time regarding a matter related to your personal goals, personality, health, outlook, and independence or initiative with a Full Moon occurring in your sign and pulling up powerful feelings. A sense of being stuck can lead to an epiphany about your true feelings on a matter. Enthusiasm stirred up in the last week of February can take you far. You may be seeking to feel more alive, vital, and vibrant through other people or through relationships. Others can inspire you to get moving. While you’re feeling motivated, you’re not inclined to go into overdrive, and this is a good thing. Steady energy helps you get things done. 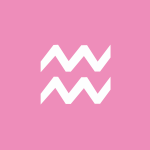 February 2019 Monthly Horoscope Summary for Libra: The month ahead is electric for your relationships, dear Libra. This is particularly the case for partnerships of all kinds, but February can also jumpstart a more casual relationship. As the month progresses, a more insular, emotional, and comfortable theme emerges. The New Moon on the 4th can serve to wipe the slate clean or invigorate matters related to creativity, hobbies, children, leisure time, or romance. It’s a time for reaching toward new or improved goals regarding any of these matters. You’re in a strong position for pushing forward with whatever you were releasing or realizing in the last week of January after the Lunar Eclipse. You’re in good shape for finding unique ways to express yourself and your affections now. Enjoying yourself and celebrating may be in order now. An introspective turn emerges slowly but surely as the month advances, starting with Venus, your ruler, heading into your home and family sector on the 3rd. This is the first and perhaps the strongest hint that you need some personal time. While you may want to watch for playing it a little too safe for your own good now, it’s a powerful period for finding your emotional center and getting in touch with your needs for safety, nurture, and security. Mercury transits your work and health sector from the 10th forward, and this transit encourages good (and smart) work habits as well as special attention to the small things that make your world go ’round! This can be a time of taking care of little problems and making sure your routines work for you, not against you. It’s an excellent time for honing skills and learning useful things. From the 14th, Mars heads into your intimacy sector, pulling you into your own head or more deeply into a relationship or special project. On the 19th, the Sun joins Mercury in your solar sixth house, further emphasizing your routines, habits, work, and health. All of these influences combined point to a quiet but practical and productive second half of the month. Uranus is spending its last full month in your partnership sector. Since it takes about 84 years to come full circle, you’re officially done with this transit by March! While you’ve learned new ways to view partnerships in recent years, there have been some upturns and instability to contend with in the process. On February 12-13, Mars joins Uranus, pointing to some fireworks. This is a powerful period for taking care of last-minute details, although we can be a little rash at this time. You might awaken to a plan, mission, or increased bravery for handling a problem once and for all. New developments in a relationship can demand new approaches. Mars then moves on–into your intimacy sector and animating your private life from February 14th until the end of March. While exciting on many levels, this is not the most comfortable place for Mars, and it can sometimes feel difficult to assert yourself directly or straightforwardly during this cycle. It is useful, however, for digging things up and stirring up passions and desires you may have ignored or buried. The Full Moon on the 19th can illuminate a matter related to your need for rest, downtime, and release from the past, stress, and pressure. You may have been feeling emotionally stuck, between a rock and a hard place, and this leads to an epiphany about your true feelings on a matter. Your intuition has a lot to tell you now, and it’s wise to pay it mind! The last days of the month find you a little bolder and more confident. You don’t want to be constrained or limited now, and there can be a stronger desire to take action on matters that you’ve put to the side. There can be excellent opportunities to make important contacts through work or pursuing daily routines, and you’re in a strong position for solving problems and crossing off items on your “to do” list. You may very well solve a mystery that has baffled you for some time. 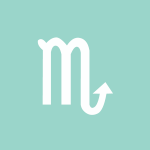 February 2019 Monthly Horoscope Summary:February begins with much attention to your personal needs and domestic world, dear Scorpio, and becomes increasingly more interactive, sociable, and creative as it goes along. All major bodies are moving in direct motion (no retrogrades!) and while there is a spattering of intense aspects to deal with, overall this is about moving things along and enjoying yourself as you do. The New Moon on the 4th occurs at the bottom of your solar chart, and it prompts the need or desire for a new beginning related to your living conditions or arrangements, home matters, your domestic or personal life, sense of security or safety, and family. It’s a time for redefining or formulating new goals related to any of these matters, and especially in the week after this lunation, it’s a strong time for pushing projects forward or taking action on recent discoveries and epiphanies. The first sign from the cosmos that you’re pulling out of yourself this month comes on the 3rd when Venus moves into your sector of communications, connections, transportation, ideas, and mental outlook. There is almost always a serious note to these things these days with both Saturn and Pluto long-term guests in this area of your solar chart. With Venus now visiting here, things lighten up a little. In fact, it’s a great time for enjoying interesting conversations, subjects, and studies. You’re inclined to reach out a little more, and as you do, you gain new inspiration. Softening your communications works beautifully in your favor during this transit. Projects are enjoyable and connections made feel especially good. Mercury transits your solar fifth house from the 10th forward, and this sparks up your creative side, particularly on a mental level. It’s a time for enjoying learning, sharing, and connecting more than usual, especially in combination with the Venus transit–these two transits complement one another well. You can produce some wonderful writing now, or you may enjoy some especially fun projects, hobbies, and pastimes. The power of your words is evident now, bringing new opportunities into your life, and word of mouth works well for you, too. Guiding and teaching are also favored now. Romantic declarations may be made. Uranus is getting ready to move into your partnership sector and is now on its final stretch in its transit of your work and health sector, meeting up with Mars on the 12-13, which stirs the pot. It’s a powerful period for moving on from an unstable period related to your daily routines, health, and self-care programs. This is a time for taking action to improve your work or habits. You can be quite pumped up to make essential changes to your usual routines. Work and daily habits require an innovative approach or new direction. You should probably watch for impulsiveness or flaring tempers, but do use this spark of energy to correct conditions that are holding you back from good health and habits, and from more fully enjoying your daily life. 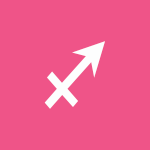 Mars moves into your partnership sector on the 14th and heats up your relationships until the end of March. While exciting for close partnerships, you can sometimes feel that you’re in the hot seat with Mars effectively challenging and opposing your sign during this transit. It’s revealing and stimulating but does require some mindfulness and self-awareness, since there can be a strong inclination to project traits onto others during this period. The last week of February brings on a bit more daring and spontaneous energy, and it looks good on you! You are enthusiastic and ready to make changes. There can be nice developments in the areas of creativity, romance, or hobbies. You might make connections that advance your personal interests, and especially the more heartfelt pursuits. You are inclined to make quick decisions just for now, mainly because you are a little tired of overthinking and you’re tuning into and trusting your intuition. Sagittarius Monthly Horoscope for February 2019: The month ahead features excellent energies for starting new projects or for other hopeful new beginnings, dear Sagittarius, mainly related to communications, studies, health, appearance, and friendships, and especially after the New Moon on the 4th. February is also strong for money matters and special attention to home and family. The lunation on the 4th frames you especially well, and is excellent for starting fresh with a personal interest, learning or transportation matter, or a project that’s close to your heart. This is a time when you’re exceptionally bright and alert, as well as when others appreciate what you’re putting out there. As the month advances, a quieter, more practical theme emerges, starting with Venus transiting your resources sector from the 3rd forward, lasting until the first of next month. This is an excellent time for building upon recent exciting ideas or projects already in place. You enjoy the idea of a steady pace at this time, and you’re extraordinarily resourceful now. Your sense of what’s valuable is strong, and you may very well score a good deal on something significant this month. Mercury transits your solar fourth house from the 10th forward, and you begin seeking out special moments or patches of rest or relaxation–a break from overthinking and overdoing. You prefer a slower pace now. You’re a little more observant with people more than facts, and you can enjoy some revealing and warm conversations. Sometimes this transit correlates with a busy home life or lots of discussions with family and loved ones. There is a lot of attention to making your life more comfortable and secure. Mercury and Venus complement one another well and are in agreement — you benefit from slowing down and pay more attention to your comfort levels. In the meantime, Uranus is on the final stretch of its transit through your romance and pleasure sector. You may have been on a bit of a rollercoaster ride in these areas for years, and now Uranus is set to leave this sector for good, not before going out with a bang as it meets up with Mars on the 12-13 this month! This is a time of strong motivation to express yourself in unique ways. There may be a sudden attraction or romantic connection now, or a final move or decision that pushes a matter forward–perhaps a make-or-break situation. Be careful not to become over-confident when it comes to taking risks now. For best results now, aim to act from the heart rather than merely react or respond to changing circumstances. Rebelliousness is not likely to serve you well, but making courageous changes may very well work out to your advantage. On February 14th, Mars moves into your work and health sector and will stick around here, firing up your desire to excel with your work, chores, routines, and health pursuits until the end of March. By the 19th, all inner planets are in background areas of your solar chart, and the second half of February is shaping up to be quiet but productive. Even so, the Full Moon on the 19th points to an epiphany or turning point regarding a career, family, or home matter. This can push you into the spotlight or out of your comfort zone for a couple of days, attending to your responsibilities to the outside world. It’s a fine time to connect with your feelings on a work project or long-term goal. The last week and especially the last few days of February are especially productive. You might decide to rearrange your living setup or reorganize your work or work environment. You are less dependent on others’ approval and a little bolder and more outgoing, and possibly a little self-centered, which is a good thing if not overdone or done too often! You are inclined to strike out on your own, and it can feel good to do so, even if you are generally keeping a low profile at this time. Working from or on the home can be especially fruitful. February 2019 Monthly Horoscope for Capricorn: February begins quietly, dear Capricorn, and while it doesn’t exactly end loudly, it certainly enlivens as the month advances. Venus moving into your sign on the 3rd is especially pleasant since it frames you well, boosts your popularity, and improves your self-image. The New Moon on the 4th is great for a new enterprise, special launches, and new beginnings. Mind you, it’s always better to wait a few days after a New Moon for brand new beginnings, but you can make some important resolutions at the time of the lunation and then pace yourself accordingly. You may be starting fresh with a money, resources, or self-esteem matter since this New Moon occurs in your solar second house. You’re inclined to open up and feel more outgoing as the month advances. First, Venus transits your sign from the 3rd forward, boosting your appeal, sense of humor, and appetite for fun and pleasure. People see you in a kinder light, in general, and more importantly, you feel good about yourself, more so than usual. You’re mixing well with others, and this can benefit you across the board, whether in business, friendship, or romance. Venus is your career sector ruler, suggesting that career and reputation matters are working in your favor now as well. You have long-term guests Saturn and Pluto, both of whom have a reputation for improving your life but also for some heaviness and intensity, in your sign, making light-hearted, breezy, and pleasant Venus in Capricorn a breath of fresh air. You deserve this! Mercury transits your solar third house from the 10th forward, and this transit complements the Venus transit nicely. You’re talking more, connecting with others, getting out and about, and seeking out more information and news. You might be doing more reading, studying, teaching or guiding, thinking, and speaking. You’re sharp and observant during this supportive transit, and others receive your ideas and the intentions behind your communications well. It’s easier to make quick decisions at this time, and you enjoy a busy rather than hectic pace. Mars moves into a creative sector of your chart on the 14th, and then the Sun joins Mercury in your communications house from the 19th, at which point all inner planets are allies. Certainly, the second half of February is playing in your favor. Mars and Uranus align in your home and family sector on the 12-13, and this potent combination occurs shortly before Uranus leaves this sector of your solar chart for good. It’s a robust period for making an empowering change related to your domestic world or living conditions/arrangements. Actions taken now may help settle your domestic life. Be cautious about making massive changes if desires come on suspiciously quickly, but keep yourself open to new methods and directions for handling old problems. Mars moves into harmony with your sign from the 14th, heating up your desires and animating your romantic life or creative world until the end of March. This is a wonderful boost. You’re confident and assertive, and even more attractive than usual. Relationships are passionate now. The Full Moon on the 19th can open your eyes to matters related to education, travel, legal, or publishing and promotion. It’s a fine time for promotional efforts or important announcements or publications. Pleasing energy connects communications and learning with creativity in the last week of February, and the urge to get something done is with you. It’s a creative and dynamic time. You might receive news that opens up doors for you, enjoy some affectionate communications or an innovative learning experience, or you could make some exciting new contacts. You’re alert, ready to make changes, and willing to put yourself out there, and this is a winning combination. 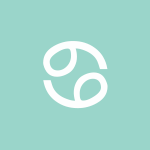 Aquarius Monthly Horoscope Summary for February 2019: The New Moon on the 4th is yours — it falls in your sign and brings you the chance to start anew and reinvent yourself. You’re in the position to start fresh and take charge of your personal life in crucial ways. It’s an especially favorable time for pushing forward with personal projects or acting on feelings that you’ve recently embraced and acknowledged, and you have some fantastic cosmic support for this in the week following this lunation. Mind you, love matters and certain projects may need some more mulling. Venus moves into your privacy sector on the 3rd, and until the end of the month, you’ll be seeking pleasure in quiet time, private moments, and perhaps even the past as you explore your feelings on the down-low. Venus will enter your sign on the first of March, and feelings and pleasures will clarify or simplify. For now, you’re dealing with many different layers to your affections, and it’s a good time to process and digest recent events and to do so slowly and carefully. Even so, watch for a tendency to attract situations that work against you or that are so complicated that they leave you feeling exhausted. Someone may be trying to take advantage of a vulnerability or your tendency to feel guilty, for example. Mercury continues to excite you mentally until the 10th, after which you’re less concerned about innovations and more focused on your practical affairs. 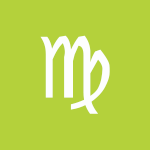 Mercury’s transit of your sign boosts your desire to express yourself, and Mars in your communications sector at the same time reinforces this further, adding a layer of courage, although sometimes impatience as well. The first half of February is powerful for both asserting and expressing yourself, although there can be times when you’re a little tense or wired. The 5-9 is especially exceptional for friendships, communications, interests, and personal appeal. The 12-13 is a stellar time for exciting developments with studies, discussions, relationships with fellow students or siblings, and learning. This is your chance for expressing your independence and enterprising spirit. You excel at innovation in general, but especially now. The second half of the month plays a little more to your practical side. Money matters assume particular importance to you. Home and family life can be busy, animated, and energetic. Conflicts may emerge, but treat them as the chance to take care of problems once and for all. Mars heats up your personal life and domestic world from February 14th until the end of March. While exciting for getting things done around the home, you can sometimes feel that your desires are working against you or that you’re at odds with others during this cycle. You can make this transit work for you with some creativity, however. The trick is to pour excess energy into constructive projects and to take a good look at how you’re expressing (or bottling) anger. Increased self-awareness can lead to solutions and improvements. The Full Moon on the 19th brings on an eyes-wide-open period regarding an intimate, financial, ownership, or dependency matter for you. The Sun heads out of your sign at this time, and this officially pulls you into the introspective phase that has been coming on gradually in February. You’re likely to delight in taking some extra time to yourself, particularly since you’ll be in higher demand in March, and now’s the time to catch up. You are enthusiastic and somewhat competitive in a healthy way in the last days of February. Don’t discount a bit of a self-centered streak now — in a healthy dose, it’s beneficial. Home life can be pleasingly animated. There can be a strong urge to handle problem areas in and around the home or with family, and the chances of making some super improvements are high. 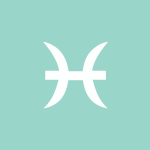 Pisces February 2019 Monthly Horoscope Summary: February is a good month for getting your bearings and taking care of unfinished business, dear Pisces. As it progresses, you really blossom and come into your own. You’re starting your new solar year on the right foot. With the New Moon on the 4th, you can feel as if you’re unblocking and unburdening. You need extra rest now, and you can be paying special attention to putting old problems behind you. You can feel quite refreshed now, ready to start anew and work on yourself from the inside out. Even so, Venus transits your social sector from the 3rd forward, making it a great time for connecting with friends, associates, or groups. Of course, you have Saturn and Pluto in this area of your chart, meaning there can be serious realizations, commitments, or alliances made as Venus moves through here. It’s not all fun and games, in other words, but Venus does increase your enjoyment, pleasure, and attraction factors. Especially in combination with Mercury in your sign from the 10th and Mars in your communications sector from the 14th, it’s one of your best times for teamwork, new and exciting projects, making valuable contacts and connections, and learning new and interesting things. You’re attracted to the original, unusual, and unconventional now. Your social life shouldn’t subtract from your efforts to detox, wind down, and recharge your emotional batteries. If it does, it’s time to make some changes! Mercury transits your sign from the 10th forward, and your interest in the world around you, and communicating with it, increases many times over now. While you were content to keep your observations to yourself in recent weeks, you’re now craving a little more interaction. Nevertheless, this is a time when you’re more inclined than usual to make executive decisions, worrying less about feedback and more about what works for you. It’s a good time for increased confidence in, and enthusiasm for, various mental projects or pursuits. You might find opportunities to make important clarifications. Mercury will spend more time than usual in your sign (until mid-April) although part of that time it will be retrograde in Pisces (from March 5 to 28). This gives you plenty of opportunities to fully explore how your mental outlook and communications work for or against you, and to make adjustments accordingly. It’s a fine time for enterprising new projects, primarily related to communications, learning, and home and family. Uranus will be leaving your resources sector for good next month after seven years there, making this month a powerful time for exciting developments with matters related to your personal income, finances, valuables, talents, or assets. Use the burst of energy on the 12-13 wisely and mindfully for best results. Aim to take action rather than merely react to what’s happening around you. The focus should now be on putting dysfunctional projects or attitudes behind you. There is a strong need to free yourself from traditional approaches to business and money making, as well as over-attachment to personal possessions so that you can move forward more freely and authentically. Since the beginning of the year, Mars has been animating your resources sector, and on February 14th, makes a big move into your communications sector. This can be an exciting time for sharing ideas, learning, connecting, and feeling tremendous enthusiasm for your current projects and interests. It can be a busy and sometimes tense time, too, if you give in to the temptation to rush things. You’ll be better off harnessing this transit’s enthusiasm, courage, and gumption while downplaying the haste, impatience, and terseness of Mars in this area of your solar chart. It’s a good time for asserting yourself, only if what you’re expressing comes from a place of realness, not as the result of impatience or too-quick reactions. The Full Moon on the 19th is in your opposite sign, and this is an eyes-wide-open time regarding a one-to-one relationship or your relationship needs. You’re awakening to, or fully embracing, your feelings about a matter. You might feel a little stuck in a situation with a friend or group just for now, but in the weeks ahead, you’re likely to act on your feelings and pursue a goal that’s dear to your heart. The last week of February finds the inner planets largely working in your sign or in your favor! Whether you’re learning or teaching, receiving or giving, you stand to gain. There is more bravery or courage in your actions, and perhaps in your communications as well, especially if you’re offering information about yourself. It’s a good time for positive feedback. This can be a time when you’re acting more decisively, when you’re more responsive, and others especially enjoy your company and input. Sun 02° Taurus 35' 39"
Moon 18° Sagittarius 10' 40"
Mercury 07° Aries 37' 25"
Venus 02° Aries 51' 14"
Mars 14° Gemini 59' 05"
Chiron 03° Aries 38' 03"